The owners of this Nelson building took a staged approach to earthquake strengthening. This meant managing costs and keeping their tenant happy. Photo courtesy of Miranda Wood. When Ben Van Dyke and Miranda Wood were notified by the Nelson City Council that their building at the heart of Nelson’s CBD was earthquake-prone, they had a costly decision to make. They had already spent more than $60,000 on structural work of the historic building, and ‘guesstimated’ that further strengthening would cost nearly $130,000. The engineer’s estimate was higher still. The building at 204 Hardy Street is known by locals as Lambretta’s, after the popular restaurant that operates on the ground floor. Customers enjoy Nelson’s long hours of sunshine under awnings beside the impressive columns. The mid-century commercial building is built from reinforced concrete with a ‘glass curtain wall’ façade. It was completed in 1956 for the New Zealand Insurance Company (NZI), who chose this façade design for their corporate image. Early in 2017, engineers from AMK Limited carried out a detailed seismic assessment and found the strength of the two-story building to be 15% of the New Building Standard (NBS). The main areas of concern were the first floor columns and the parapets. These elements are the first to be addressed in a seismic upgrade scheme that took the building to 70% NBS. Nelson City Council (NCC) sent a survey to all owners of Nelson heritage buildings, along with an application for Council funding to help with earthquake strengthening. Ben and Miranda had already been through a ‘bureaucratic obstacle course’ to strengthen the building in the past, so were hesitant to apply for funding. Ben and Miranda chose to undertake the project in stages. In June 2017 they were awarded $94,700 from Heritage EQUIP for the first phase of the work. A year later Heritage EQUIP provided a further $80,000 for the next stage. Ben and Miranda also received a $10,000 grant from Nelson City Council. 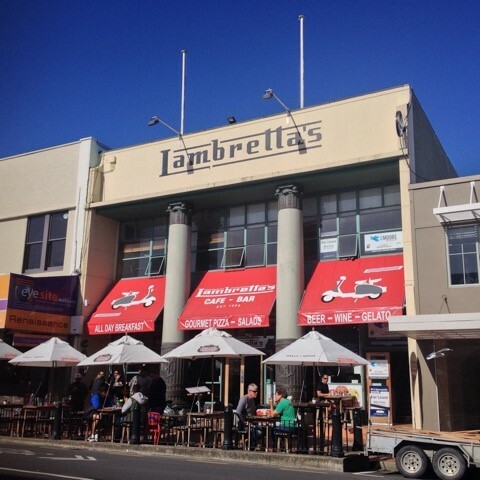 The strengthening work, which was only internal, didn’t affect the building’s heritage value and Lambretta's continued to be part of Nelson’s cityscape. The building has architectural significance because it showcases the work of notable New Zealand architectural firm Gummer & Ford and Nelson architect Alexander Bowman. Its association with NZI and a well-known local law firm, Fell & Harley (who owned the building from 1982 to 1991), makes it of historical importance too. The building is a Category 2 historic place on the Heritage New Zealand List, and a Heritage Category C in the council’s district plan. “We have lost many heritage buildings in this area and those remaining need to be cherished and strengthened for the enjoyment of future generations,” says Miranda. New steel cross bracing added to the roof space. Photo courtesy of Miranda Wood. The building was strengthened in two stages – the first stage was part funded by Heritage EQUIP and aimed to achieve at least 34% NBS, while completion of the second stage saw the building achieve 70% NBS. Breaking the work into two made it less of a strain financially, and less disruptive for the restaurant. strengthening the double brick infill wall above first-floor level. installing new structural steel frames and concrete shear walls. Ben and Miranda have encountered a number of challenges along the way, including finding professionals, securing funding, and working around the peak times at the restaurant. Until they hired an engineer, they had no way of knowing how big the job would be, what was involved or how much it would cost. The first engineers that worked on the project were slow to provide a quote and were costly in terms of time and money. It was a frustrating time for Ben and Miranda, but they say it’s definitely worth waiting to have the best engineers work on your heritage building. They recommend speaking to others who have gone through the process, and to Heritage EQUIP. “Shop around for a good and honest structural engineer. If things go to custard, sack them,” says Ben. The first stage of the project was completed by September. Work on the ground floor was more difficult as it could only be done when the restaurant was closed. Ben and Miranda carried out the work in stages during winter, when the restaurant was not as busy, to minimise the impact on the tenant. The upstairs space has been vacant since the building was deemed earthquake prone. Ben and Miranda hope to be able to rent the upstairs to a commercial tenant now the strengthening work has been completed. “We had interest from an individual who wanted to open an art gallery – this would be a perfect match for the light-filled space. It’s also well suited to offices or community-based organisations. Being located in the heart of Nelson’s CBD adds to 204 Hardy Street’s attraction,” says Miranda. Heliflex ties were used to tie together the double brick infill walls.